Share the post "Choosing The Right Fibroid Treatment"
As treatment alternatives for fibroids continue to grow, it may be difficult to decide what option works best for you. Get tips on what you and your physician should consider when choosing a treatment. With all of the treatment options out there, how do I decide which treatment option is best for me? When it comes to choosing a fibroid treatment, there isn’t a cookie-cutter solution that works best for all women affected with fibroids. In choosing a treatment option, it is suggested that every women discuss the alternatives with her physician so as to hone in on a treatment option that works best with the patient’s lifestyle, needs, expectations and preferences. 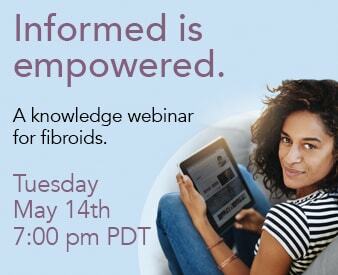 Are the fibroids causing problems or negatively affecting your quality of life? Fibroids that are not causing problems may need no treatment at all. A woman should be checked by her doctor every few months to see if the fibroids are growing. If the fibroids begin to cause symptoms that are negatively affecting your quality of life, it may be time to consider treatment. What types of symtpoms are the fibroids causing? The best treatment choice may be different if fibroids are causing severe pain than if a woman’s major problem is heavy bleeding. Treatment that shrinks fibroids (Uterine Fibroids Embolization or treatment with a GnRH agonist drug) often relieves pain. Do you want to have more children? Fibroids in the uterus usually do not prevent a woman from becoming pregnant, yet there are some instances when certain types of fibroids may cause issues with infertility. These fibroids can usually be treated with UFE or myomectomy to allow one to become pregnant. However, a woman cannot become pregnant or carry a baby after having a hysterectomy (removal of the uterus). A myomectomy preserves the uterus but may make it more difficult to become pregnant. Patients that undergo embolization also have their uterus’ preserved and often are able to conceive after the procedure. Do you want to avoid having major surgery? A hysterectomy is major surgery, requiring two to five days in the hospital and about six weeks to recover fully. Some women and some doctors feel that a hysterectomy is undesirable for a problem such as fibroids that is not life threatening. However, a myomectomy is also major surgery, requiring about the same length of time in the hospital and about the same recovery time as a hysterectomy. Women who want to avoid major surgery may wish to consult a doctor regarding new procedures that in some cases offer alternatives to hysterectomy or myomectomy. One in particular being Uterine Fibroid Embolization. This procedure is not only effective and less invasive, but it also offers the benefit of being an out-patient procedure and usually only takes up to 7 days for recovery. Getting Help. If you have been diagnosed with fibroids or suspect that you may have fibroids, feel free to give us a call at 866-362-6463 so that we may schedule you for a FREE consultation with Dr. Bruce McLucas. By taking advantage of this free consultation, the doctor can discuss treatment options with you and you help you decide whether UAE is a viable optionfor you.